It’s well accepted that moons form after planets. In fact, only a few months ago, astronomers spotted a new moon forming deep within Saturn’s rings, 4.5 billion years after the planet initially formed. But new research suggests Saturn’s icy moon Titan — famous for its rivers and lakes of liquid methane — may have formed before its parent planet, contradicting the theory that Titan formed within the warm disk surrounding an infant Saturn. 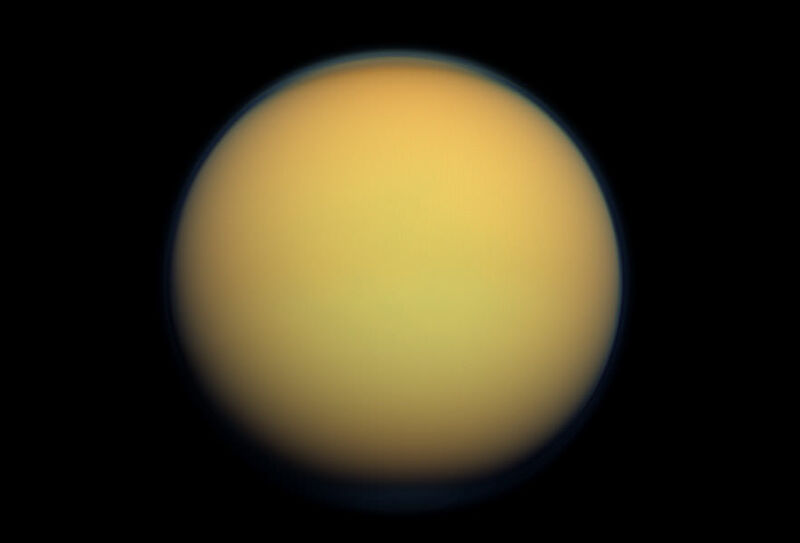 A combined NASA and ESA-funded study has found firm evidence that the nitrogen in Titan’s atmosphere originated in conditions similar to the cold birthplace of the most ancient comets from the Oort cloud — a spherical shell of icy particles that enshrouds the Solar System. The hint comes in the form of a ratio. All elements have a certain number of known isotopes — variants of that element with the same number of protons that differ in their number of neutrons. The ratio of one isotope to another isotope is a crucial diagnostic tool. In planetary atmospheres and surface materials, the amount of one isotope relative to another isotope is closely tied to the conditions under which materials form. Any change in the ratio will allow scientists to deduce an age for that material. The team found that our Solar System is not old enough for this nitrogen isotope ratio to have changed as much as it has. By comparing the small change within this ratio, Mandt and colleagues found that it seemed more similar to Oort cloud comets than to Solar System bodies including planets and comets born in the Kuiper belt. The team is eager to see whether their findings are supported by data from ESA’s Rosetta mission, which will study comet 67P/Churyumov-Gerasimenko later this year. Finally, the study also has implications for Earth. In the past, researchers assumed a connection between comets, Titan and Earth. But these results show that the nitrogen isotope ratio is different on Titan and Earth, suggesting the sources of Earth’s and Titan’s nitrogen must have been different. It’s unclear whether Earth received nitrogen from early meteorites or if it was captured directly from the disk of gas that formed the Solar System. This is an interesting finding. I wonder how they ruled out the possibility of a nitrogen heavy large object from the outer solar system smashing into Titan when it was young, changing the ratio. Something like Sedna or Pluto, except from further out. Hi, I’m Kathy Mandt the lead author of this study. I want to thank Shannon Hall for posting this and everyone for your interest in these results. This is a very good question about a nitrogen-heavy object possibly being the source of Titan’s nitrogen. At the present time we do not know the isotope ratio for Pluto’s nitrogen atmosphere, but we are hoping that the Alice instrument on the New Horizons spacecraft can make this measurement. We expect the isotope ratio on Pluto to be like Jupiter and the solar wind, which is VERY different from comets and Titan. For an object like Pluto or Sedna to be the source of Titan’s nitrogen, a massive change in the isotope ratio is required to take place over a very short period of time due to the collision. Our study showed that rapidly losing material from Titan’s atmosphere will not significantly change the isotope ratio because both isotopes are lost. This is why we are able to conclude that the source of Titan’s nitrogen atmosphere originated in conditions similar to comets. Theories, theories, theories, we’ll definitely never know how the Universe works. Yes! We’re intelligent and now more advanced in technology but we have a long way to go before we truly understand. Is it really possible for the moon to be older than the Mother Planet? Or is Titan a Planet on it’s own that just love to hang around the Mother Planet Saturn? Analogous to how an image is worth a thousand words, a theory is better than a thousand disparate observations. … how the Universe works. It is only quite a whiles into the preceding inflation that our current knowledge breaks down. It is only for exotic phenomena that our current knowledge breaks down. For example, if dark matter is WIMPs, a nuclei of your body will experience a minuscule heating from a direct collision once every few years. But 99.9999999 % of what we do we know all the basic laws for. I think you are reaching not for what we already know robustly (little likelihood for revision), but for the open-ended business end of science. But that is not about how the universe works as such, it is about the very many details that low-temperature, non-exotic phenomena engender as its dynamic plays out. Small picture, not big picture. Ah, a possible capture like Triton, albeit Triton is believed to be from the Kuiper belt. Speaking of which, ironic if Titan is the long sought for “planet X”.